Genetic variation within cultivated crops has been identified, but it is unclear if there exists sufficient diversity to deliver the range in adapted phenotypes required for adequate yield gains. It is difficult to accurately determine the level of diversity within crops due to differences in genotypes selected for studies and the contrasting experimental and environmental conditions in which they are screened (see the 'Stresses and the Key Plant Physiological Adaptations' section). Perhaps an appropriate measure of the diversity within elite material can be performed by the identification of germplasm registrations and variety releases. For the most part, there have been few examples of successful varietal releases targeting either salinity, waterlogging or inundation tolerance. For salinity, Flowers and Yeo (1995) report that from when records began until 1993 they were only able to identify 25 cultivars from 12 plant species that had been released for their improved salt tolerance. Flowers (2004) also reported that between 1993 and 2000 there had been only three additional registrations, including one for lucerne (Al-Doss and Smith, 1998) and two for rice (Oliver-Inciong, 1996). Encouragingly, during recent years the release of varieties with improved salt tolerance has become more frequent through using key germplasm sources, such as 'Kharchia 65' in wheat (Rana, 1986), and 'Pokkali' and 'Nona Bokra' in rice (Gregorio et al., 2002). Fig. 6.4. Generalized breeding scheme showing the assessment and incorporation of new genetic variation for salinity, waterlogging and inundation tolerance. Conventional breeding approaches (1) may be successful if sufficient genetic variation exists within germplasm (e.g. lucerne, Al-Doss and Smith, 1998; rice, Gregorio et al., 2002; wheat, Setter and Waters, 2003; Munns et al., 2006). When there is insufficient genetic variation, new diversity can be introduced through domestication (2) (e.g. Distichlis spp., Yensen and Bedell, 1993), recombinant line introgression (3) (e.g. 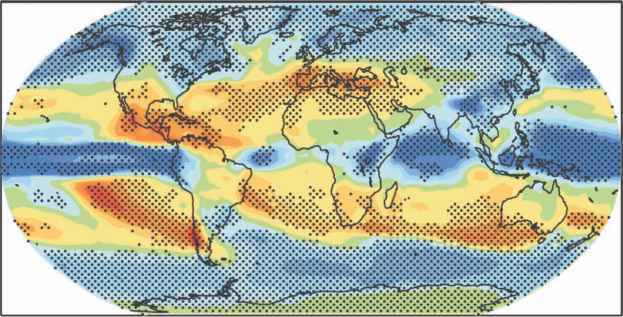 wheat, Wang et al., 2003), amphiploid production (4) (e.g. wheat, King et al., 1997), use of transgenics (5) (e.g. wheat, Xue et al., 2004), use of landraces (6) (e.g. maize, Day, 1987; wheat, Munns et al., 2000; Singh and Chatrath, 2001) and use of synthetic hexaploids (7) (e.g. wheat, Villareal et al., 2001; Reynolds et al., 2005). Physiological trait selection and screening (8) (e.g. rice, Gregorio et al., 2002) and marker assisted selection (9) (e.g. 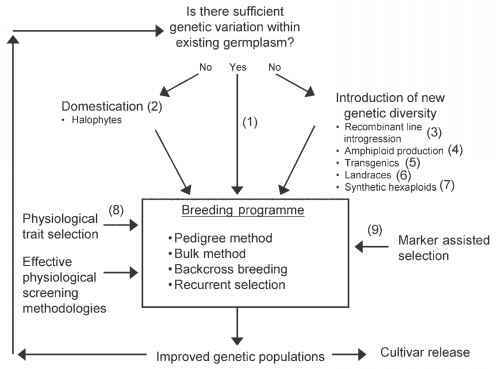 rice, Xu and Mackill, 1996; wheat, Lindsay et al., 2004) may also increase the efficiency of conventional breeding approaches and contribute to more rapid production of improved populations and cultivars. species, the low number of currently released cultivars with tolerance indicates that using the available germplasm is not likely to be sufficient and that alternate sources of genetic variation need to be identified and utilized.